The 2018 midterms were a mixed bag for democracy. On the one hand, Americans got a good look at the impact voter suppression can have on tight races — especially as a result of the focus on Georgia’s gubernatorial contest — and learned that the perpetrators of these policies are still getting away with it. On the other hand, voters across the country demonstrated an appetite for better democracy and more transparency. While it is disheartening to witness voter suppression efforts succeed in the wake of the Shelby County V. Holder decision of the Roberts Supreme Court, what the midterms have shown overall is very encouraging. And parties, candidates, political groups and concerned individuals should take note: Strengthening election integrity laws is a winning message and the time to do so is now. Whether it was Amendment 4 in Florida, which restored the voting rights of 1.5 million former felons in Florida and passed with 64 percent of the vote, or the anti-gerrymandering measures that voters backed in Michigan, Colorado, Missouri, and Utah, democracy did win a few battles this year. The fact that even a very conservative state like Utah supports fair redistricting is especially promising. And voters in Michigan did not just vote against gerrymandering, they also supported an initiative to institute same-day voter registration, no-excuse absentee voting and automatic voter registration. Nevada also passed the latter. These victories, which have largely been ignored by the media, do more than just inspire hope. They show that voters will choose fair elections when they are given the choice. And, most importantly, they should serve as a roadmap for candidates and activists alike. Because, while House Democrats have sent some encouraging signs about supporting sweeping election reforms, it is unlikely that anything they pass will get signed into law in the near term. That means real change has to be driven by grassroots movements — and the midterms have proven that this is possible even in deep-red states. Activists should start trying right now to get more ballot initiatives in front of voters that increase transparency, especially with regard to money in politics; make voter registration easier; roll back voter suppression laws; and prohibit gerrymandering. Americans in every state should get a chance to weigh in on these initiatives. Even if they do not pass, putting these issues front and center will allow voters to see who supports fair elections and who opposes them. And if the midterms are any indication, those who exercise their right to vote will not look too kindly on anyone standing in the way of a more robust democracy. 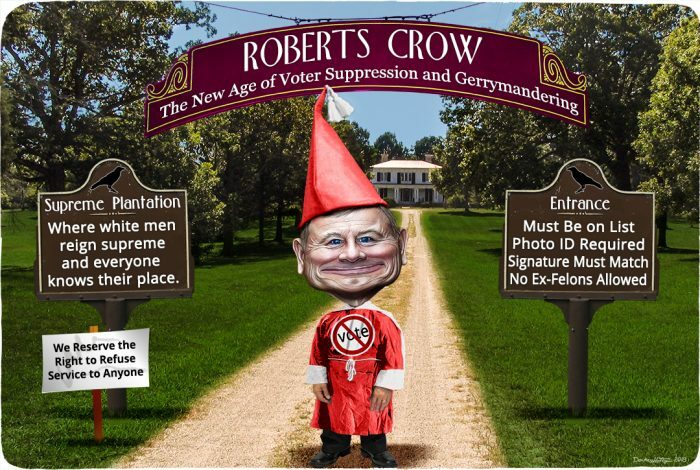 The cartoon above was created by DonkeyHotey for WhoWhatWhy from these images:John Roberts caricature (DonkeyHotey / Flickr – CC BY 2.0), Imperial Wizard (Stuart Thomson / Wikimedia), hanging sign (skyfirexnews / Flickr – CC BY 2.0), sign (Ken Lund / Flickr – CC BY-SA 2.0), and crow (Andreas Plank / Wikimedia – CC BY-SA 3.0).